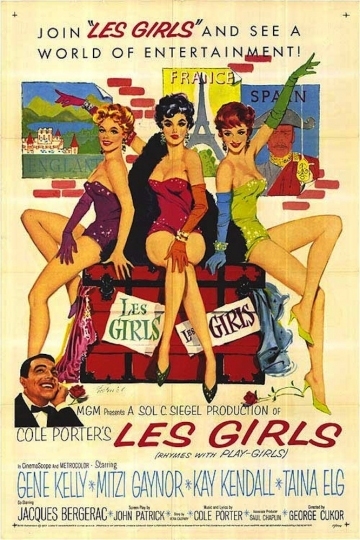 "Join "Les Girls" And See A World Of Entertainment !" When a dancer publishes her memoirs, she is sued for libel by the other two members of her troupe. Utilizing a clever "Rashomon" style flashback, this Cole Porter musical offers each of the dancer's differing points of view as they recall their relationship with the great hoofer, Gene Kelly. Directed by the great George Cukor. Co-starring Mitzi Gaynor. Les Girls is currently available to watch and stream, buy on demand at Amazon, Vudu, Google Play, FandangoNow, iTunes, YouTube VOD online.